Other writings – some more medieval stuff is on its way! I have started working on a new story set late in the 13th century. So far, I know very little, beyond him being called Robert, she being an Eleanor who has been left orphaned and alone. Edward I has decided Ellie is to wed Robert – his way of rewarding Robert for his faithful service. The fact that Robert killed Ellie’s father is a teensy-weensy (not…) wrinkle in their HEA as is Robert’s long-time mistress, who has no intention of being relegated to the background by this very young wife of his. 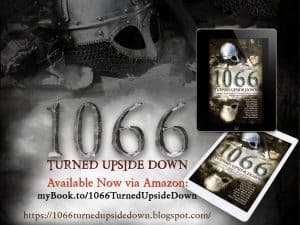 I’m a proud collaborator to “1066 Turned Upside Down”, exploring what might have happened had William the Conqueror lost.